A few weeks ago, on June 6th 2015, I married my best friend at the Grand View Overlook in Palmer Park, Colorado Springs. We were married on the 3 year anniversary of the day we met and at the location where we first met. The day was, for lack of a better word, PERFECT. 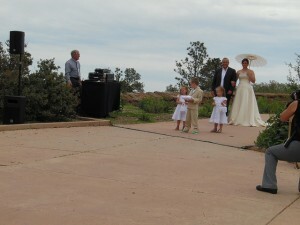 Our ceremony took place at Palmer Park’s Grand View Overlook in Colorado Springs and we held our reception at Lazy Land in the same park. A Piece of Cake Catering took great care of us at the reception with an amazing spread and Marvelous Images Photography was there to capture our EPIC day. THANK YOU to all of our family and friends whom attended! Our special day was made even more special with your presence. After the reception, we had a party bus rented from Denver Limo, Inc. ready to take 33 of our guests to Garden of the Gods for pictures and fun on the town. The bus traveled through Garden of the Gods, Rock Ledge Ranch, scenic overlooks and downtown Springs. Our driver was AWESOME… THANK YOU KEN!! We decided to have our honeymoon here in CO hiking our favorite mountains. Pictures of our adventures can be viewed here. These are the vendors who helped make our day INCREDIBLE!! Any of them will take care of you and are extremely accommodating. Sean Lynch, our DJ, set up at the Grand View Overlook in Palmer Park for the ceremony, only to tear down and re-set up in Lazy Land for our reception.